Being a new parent can raise a lot of questions. From nutrition to sleeping patterns to overall wellness, there’s a lot to consider when raising a newborn. During the wintertime, we were curious whether or not the cold and dry winter air affected newborns the same the same way it does older children and adults. That’s why we asked our resident health expert, Nurse Kate – who is a new mom herself. Does dry winter air affect baby baby health? Winter air is typically low in moisture, which causes our nasal passages to dry out more easily. Dry winter air also allows viruses and bacteria to remain in the air for longer periods of time after a cough or sneeze. Both of these factors leave us prone to illnesses such as colds, the flu, and sinus infections during the winter months. Because babies are more vulnerable to moisture loss, and their airways are much smaller than ours, they are particular sensitive to the drying effects of winter air. They are more likely to get bloody noses, dry cracked skin, get sick more often, and may experience more severe complications from seasonal illnesses. What symptoms should new parents look for when caring for their baby over the winter? Dry, cracked skin: Babies have sensitive skin, which can dry out easily. Using a good moisturizer or lotion with high quality, simple ingredients can help lock in moisture. Sinus irritation: Keep an eye out for blood tinged boogers or bloody noses. 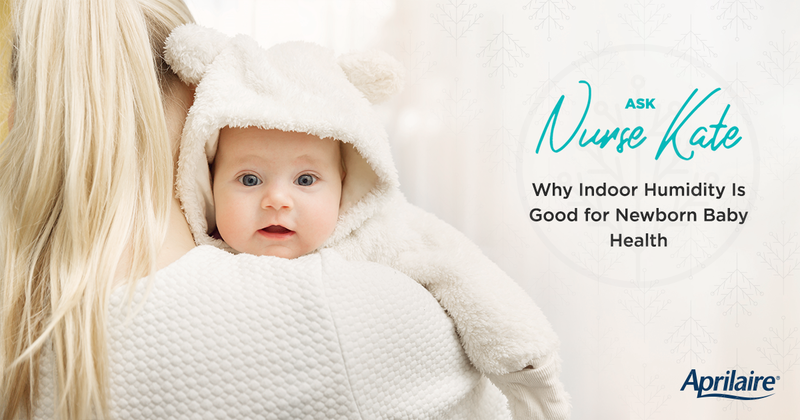 The presence of these symptoms indicates the nasal passage is likely dry or irritated, affecting your baby’s health and leaving your newborn more vulnerable to wintertime illnesses. Using an indoor humidifier or a saline nasal spray made specifically for babies can help keep your baby happy and healthy during the winter season. Cough, congestion and difficulty breathing: The American Academy of Pediatrics offers a helpful rundown of what to do when your child has an upper respiratory infection. Click here for more information.If you have any questions or concerns about your child’s symptoms, contact your pediatrician or family doctor. Being too cold: Babies are not able to handle the cold temperatures as well as we can. If temperatures and wind chills are below freezing, limit the time your baby spends outdoors. Make sure to dress your baby in appropriate layers, keeping in mind winter coats and snow suits shouldn’t be worn under a car seat harness. Check out the AAP’s tips on how to dress a baby for cold weather and winter car seat safety for more info. When it comes to humidity, what are the best conditions to keep your baby healthy? The EPA recommends keeping indoor humidity levels to between 30-50%. You can reach this ideal humidity level by utilizing a whole home humidification system, or smaller plug-in humidifier. Most local hardware stores sell humidity gauges to help you determine what the humidity levels are in your home. What are some additional tips and tricks parents can implement to keep their babies healthy? Good nutrition: Whether your baby is bottle fed or just starting solid foods, make sure he or she is receiving the correct nutrients. A good, healthy diet helps your baby’s immune system stay strong during the winter months. Good sleep: Sleep is essential to staying healthy during the winter months. Sometimes holiday travel can interrupt babies’ sleep cycle, so do what you can to ensure your baby receives enough sleep. Good hand hygiene: Your baby may not be able to wash his or her hands yet, but you can! Do your best to wash your hands regularly, particularly before or after feeding, bathing, or cuddling with your infant. He or she will eventually thank you for doing your part in stopping the spread of wintertime illnesses! Be sure to keep the humidity in your home between 30-50% for you and your baby. In the wintertime, a trusted humidifier can help you keep your family happy and healthy. Find out how easy it is to maintain winter wellness in your home. Find a pro today!